Third quarter revenue up by 15 % to MNOK 2,271.5 (1,971.9). Earnings before depreciation (EBITDA) in the third quarter were MNOK 514.7 (228.5). Net result after tax in third quarter was MNOK 374.8 (414.4). Ancillary revenue pr passenger up 41 % in the third quarter. 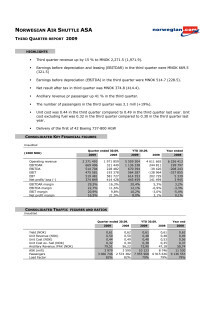 The number of passengers in the third quarter was 3.1 mill (+19%). Unit cost was 0.44 in the third quarter compared to 0.49 in the third quarter last year. Unit cost excluding fuel was 0.32 in the third quarter compared to 0.30 in the third quarter last year. On October 21 Norwegian exercised 6 purchase rights for Boeing 737-800 aircraft, making the total order for direct-buy aircraft 48. 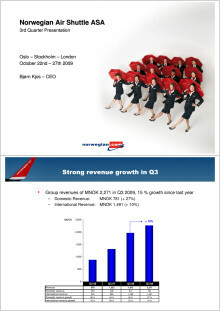 Today Norwegian presents the highest operating profit in the history of the company. Earnings before tax (EBT) in Q3 were MNOK 519, an improvement of more than MNOK 326 compared to the same period in 2008. As part of the company's strong expansion, Norwegian has placed an additional order for six new Boeing 737-800, making the accumulated order for leased and purchased aircraft count 70 by 2014.